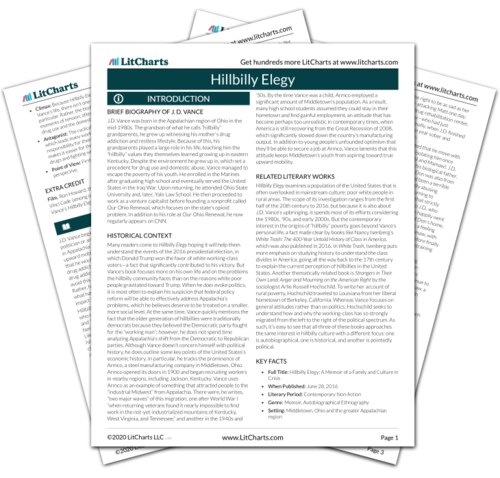 Instant downloads of all 942 LitChart PDFs (including Hillbilly Elegy). 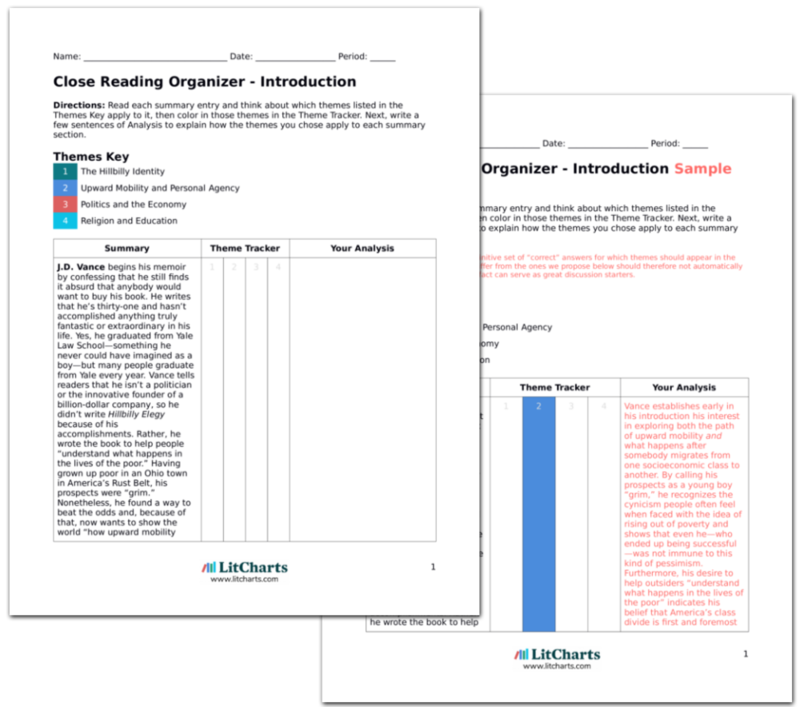 LitCharts assigns a color and icon to each theme in Hillbilly Elegy, which you can use to track the themes throughout the work. Vance takes a moment to sing the praises of his sister Lindsay, who served as his protector when Bev’s life was chaotic and dangerous. Indeed, he admits that he always saw Lindsay as “more adult than child,” a perception that started to become even clearer when, as a late teenager, she had an opportunity to follow her dreams of being a model. Hoping to catch a break and kickstart her career, she convinced her mother and Mamaw to drive her to a local hotel, where an agency was holding auditions. When they got there, they asked if J.D. would like to be considered, too, an offer he happily accepted. By day’s end, they were told that they had advanced to the next round, which would be held in New York City. They were giddy with excitement on the ride home until Bev expressed concerns about being able to pay for the opportunity. This led to a heated fight in which Bev slapped and punched the kids while driving, until Mamaw threatened to shoot her in the face if she didn’t calm down. The fact that Lindsay and J.D. couldn’t go to New York to pursue the possibility of being models demonstrates the limitations that were placed upon their lives due to their family’s economic standing. Furthermore, Bev’s violent reaction is in keeping with Vance’s description of the hillbilly tendency to settle conflicts using violence. Ironically, she only stops hitting her children when her mother threatens to shoot her in the face. In this way, Mamaw condemns using violence while simultaneously promoting the effectiveness of physical threats when it comes to conflict resolution. When Vance says that he sought reassurance from Mamaw that religion “could still make sense of the world” he lived in, he suggests that he yearned for some sort of stability, or something he could invest himself in that might help him conceptualize his otherwise hopeless circumstances. This impulse to search for stability in religion foreshadows his later interest in Christianity and his eventual belief that a church can give a young person a dependable community. As time went on, Bev’s romantic partners continued to come in and out of Vance’s life, and it became clear that Bob Hamel had no intention of keeping up with his role as J.D.’s adoptive father. Sensing this, Bev encouraged her son to call Don Bowman one day, a suggestion that prompted J.D. and his biological father to slowly rekindle their relationship. Despite what he had been told, Vance learned that his father was a kind man. Mamaw and Bev had insisted that he was abusive, but Don denied this. He had also become religious, a devoted Christian who was very involved in church life. Contrary to Bev’s assertion that Don had willingly given J.D. up for adoption, Vance learned that his father had fought hard for custody until, seeing that it was taking a psychological toll on his son, he relented and let Bev have full custody. Vance’s biological father played an important role in his life, largely because his absence was perhaps the first indication to J.D. that he could not depend upon his immediate family to support him. That Mamaw eagerly propagated an unfavorable narrative about Don once again shows her loyalty, for she most likely told Vance that Don was a bad man in order to take Bev’s side of the conflict. Don Bowman’s church finally provided Vance with the stability and community he yearned for. Earlier, when he asked Mamaw if God loved their family, he was trying to determine if religion could “make sense of the world” he lived in. Unfortunately, Mamaw didn’t go to church, and so her religiosity lent no real stability to Vance’s life. When he witnessed his father’s church community, though, he suddenly saw that religion could indeed provide support for people struggling to survive in a “broken world.” By writing about the church’s willingness to help its members buy cars or secure a job, Vance proposes religion as a possible means of attaining upward mobility. 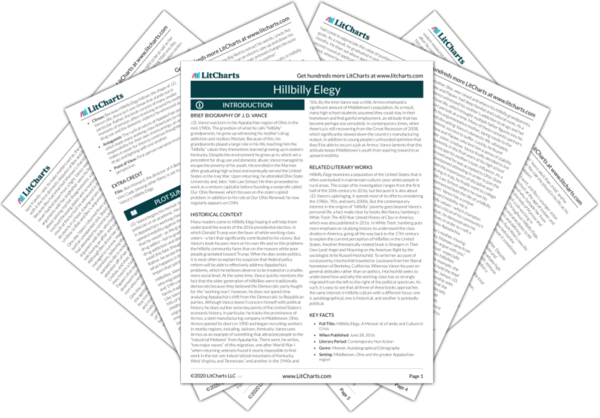 Get the entire Hillbilly Elegy LitChart as a printable PDF. Lannamann, Taylor. "Hillbilly Elegy Chapter 6." LitCharts. LitCharts LLC, 15 Oct 2017. Web. 18 Apr 2019. Lannamann, Taylor. "Hillbilly Elegy Chapter 6." LitCharts LLC, October 15, 2017. Retrieved April 18, 2019. https://www.litcharts.com/lit/hillbilly-elegy/chapter-6.